Gardening 2010. I can’t believe it. I’m going to garden this year. This year my hubby and I have decided to try and grow a vegetable garden. This is not only frugal but also healthy and educational too. We live in the woods where the deer are plentiful, so that has caused us some doubt so we aren’t getting our hopes up. We decided a couple months ago to create a small garden in our front yard where it would be easy to maintain with our toddler daughter. Then earlier last month I was looking at my favorite organizer site DIYplanner.com and saw this Garden Planting List which is based on the Square Foot Gardening method, so I had to check it out. To my amazement everyone else in the frugal blogging world seems to be doing the same thing. Yesterday, I put a “hold” on the book at the library since everyone in the area seems to have checked it out. It is a super popular method. What is Square Foot Gardening method? Super simple. Create an above ground grid approximately 6 to 8 inches high by 4 feet by 4 feet square. Fill in the mix with 1/3 compost, 1/3 peat moss and 1/3 coarse vermiculite (no dirt needed). Per the web site a blended compost made from many ingredients provides all the nutrients the plants require (no chemical fertilizers needed). Peat moss and vermiculite help hold moisture and keep the soil loose. It’s best to make your own compost from many ingredients. Last weekend we created the grid for our Square Foot Garden. I’ll post a picture tomorrow. Today, my dear husband went to Home Depot to get some materials for our garden and materials for our new play ground. We are working on several landscaping projects, our front landscape per our 2010 Savings Challenge, our backyard play area and now the garden. At this time, we are doing a lot of it ourselves. Which is a lot of fun and it has saved us a lot of money. Then later this evening we all hopped into the car and went to Lowes to get the rest of the ingredients to start our garden. 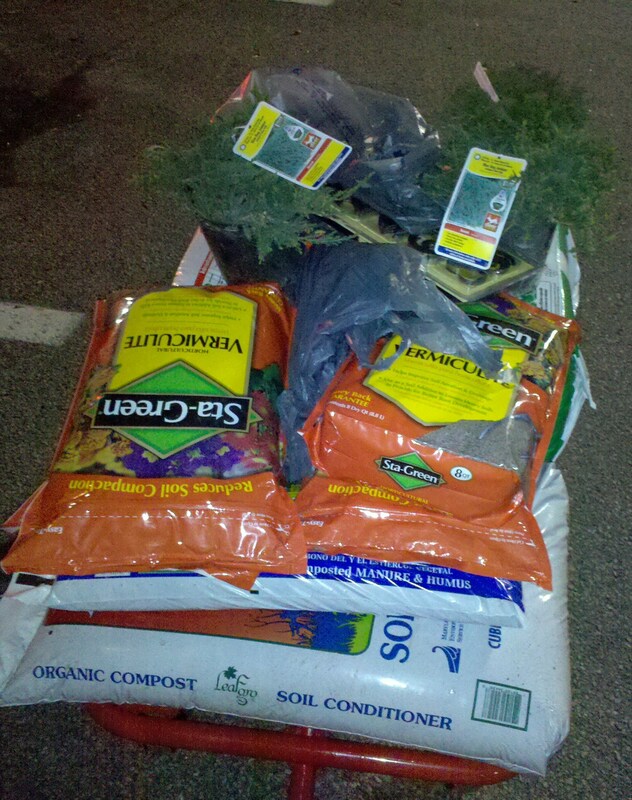 We got 1 large bag of Peat Moss, 2 different bags of Compost: 1 organic manure and humus, and 1 organic, plus the vermiculite. We also are going to include our own leaf compost from our backyard which is very rich, and some dried leaf mulch that we got from the dump (still deciding how much to include). The vermiculite was a little expensive and it doesn’t look to be “coarse”. I strongly suggest going to a nursery and checking the prices there. I’ll post my prices shortly. I have to go rest now my allergies are really acting up. Tomorrow is going to be a busy day! My daughter is going to love getting in the dirt.